I was originally saving this car for Car Week, but since I have another project in the works thatll (hopefully) be done before then, and it’s 1 Car per day (darn! ), I decided to show this off now. This car has been in the works pretty much since I started customizing. 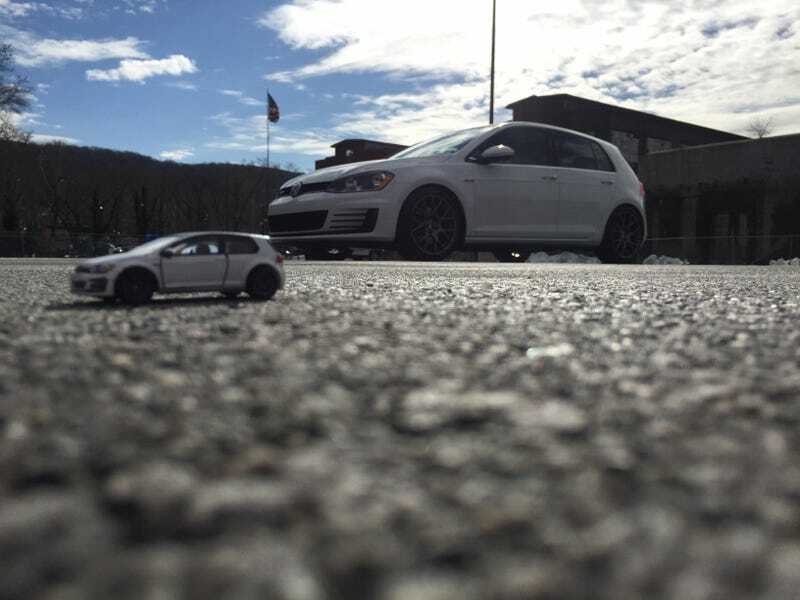 It is supposed to be a recreation of my dad’s 2015 Golf GTI SE, without the lighting package or performance package. It sits on VMR 810 FF wheels and VWR lowering springs. The first thing related to this car was on May 12, 2017. Group44 was graitous enough to donate a Euro Style Golf that had been the wheel donor for another car. I originally put the metal base on a custom blue car, but that same metal base (and I’m pretty sure the body itself) is what is before you today. Kudos Group44!! The first time something related to this car made an appearance here was on July 7, 2017, asking for advice on wheel choice. I could wheely use some help with wheels. Hey all, so I just wanted to tap into the LaLD hive mind and get some advice. Philiphilip recommended the wheels from the Air cooled SP2, which is what you’ll find on this car, Painted in a special mix of Testor paints, and shod in the tires from the Forza 911. I actually posted a picture of this car on my Instagram about a day or two before Car Week was announced. Heck this has been done for over a month, as this was a gift for my dad on his Birthday. But I deleted the pictures, figuring I’d save the full release for Car Week. But since I have another long term project in the works, which will hopefully blow your socks off, I decided to use this as a promotional piece for Car Week. I have a couple more cars that I will be posting in the next week since I have a surplus of cars that I have not shown here which didn’t make the cut for Car Week. I still actually have the car from the above post, and just keep it turned the way the runs don’t show. Whereas that car was painted in a white that was from a primer, this car is painted actual gloss white. And it was a blessing in disguise. Comparing them now, the new car looks leaps and bounds better then the old one in every way. There is still room for improvement. The paint isn’t as white as I wish it was, and somehow dirt got somewhat underneath the clear coat. I’d like to eventually get decals for the GTI logo and VW logo. Properly lower it, and cut tinted glass and add a transparent sunroof instead of the painted one. Not to mention the taillights aren’t as nice as I wasn’t hoping. In fact I would’ve done it again, but I had a deadline of my dad’s birthday. The case is of course from an m2, however it is sadly scratched up. And when I went to glue the VW on top, the glue ate into the acrylic. As soon as I land my hands on a new case I’ll be replacing the clear. And While I don’t havea picture of it, I used two cut down screws, one at an angle, to kinda “pinch” the car in place. But it still allows you to remove it. Overall a pretty good deal. I also think the interior looks pretty good. The red lines in the door cards are only visible at night on the GTI. Overall I’m still really happy with it, and my dad absolutely loves it and keeps it on his desk at work. Anyway, be ready for the next car. It’s Very Orange.